The Virginia Department of Transportation (VDOT) is looking at drastic measures to try and reduce the impact of congestion in I-495 on the neighborhoods near the Beltway. Traffic on the Beltway bottlenecks at the American Legion Bridge. While longer term plans are in development to extend the express lanes to the bridge, as it stands the bottleneck builds on the Virginia side in the afternoons. Congestion on I-495 often results in navigation apps like Waze of Google Maps redirecting drivers through the smaller side streets in the surrounding neighborhoods, overcrowding the residential streets and sometimes sealing local residents inside their driveways. 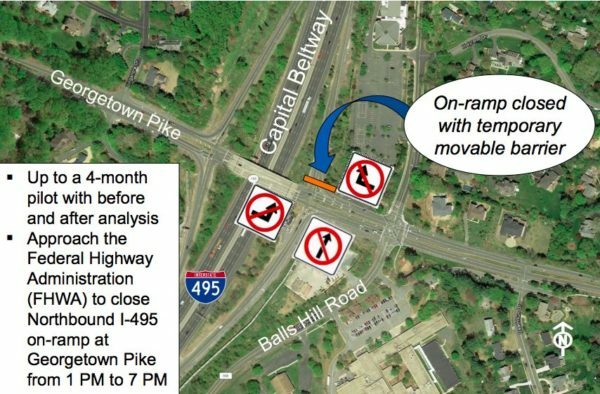 On Thursday (Sept. 13), VDOT will host a meeting to discuss proposals to address neighborhood access and congestion concerns, among them a plan to implement a pilot program that would limit access to the ramp from Georgetown Pike to Northbound I-495 during weekday afternoon/evening periods. While closing the ramp would limit access from the Beltway to local streets, it would also limit the access for local residents to the Beltway. The meeting will be held at McLean High School (1633 Davidson Road) at 7 p.m. Public comments can also be emailed to [email protected] with “McLean Traffic Analysis” in the subject line.